One of the curses of the 21st Century is the large number of usernames and passwords we need to remember. Whatever website you are visiting nowadays requires you to register whether it is for viewing the pictures from the school play or buying clothes from that online retailer. Many people get around the problem by using the same username and password for every site and application they use but this is very insecure. If a hacker manages to get hold of the password for one of your usernames then they have the password for everything. This guide provides the silver bullet and solves all of your password management issues. If you are running Ubuntu click on the Unity dash icon at the top of the Unity launcher and start searching for password and keys. When the "Password and keys" icon appears, click on it. Create and manage PGP and SSH keys and to save passwords that are difficult to remember. Seahorse has a menu at the top and two main panels. The right panel shows the details of the selected option from the left panel. Seahorse can be used to store passwords to commonly used websites. To see the stored passwords click on the "Logins" link in the left panel underneath "Passwords"
You will probably notice that there is already a list of links to websites that you have used. You can see the details stored on that website by right-clicking on the link and choosing "Properties". The key tab shows the link to the website and a password link. You can view the password for the site by clicking "show password". The details tab shows more details including the user name. To create a new password click on the plus symbol and select "Stored Password" from the screen that appears. Enter the URL to the site in the description window and the password in the password box and press OK. It is important that when you are away from your computer that the lock is applied to the Login passwords otherwise anybody could have access to all of your usernames and passwords. To apply the lock right click on the passwords option and select "Lock". If you find yourself connecting regularly to the same SSH server (for instance if you own a Raspberry PI) you can create a public key which you place on the SSH server so that when you want to connect to it you never have to log in. To create the SSH key click the "OpenSSH Keys" option in the left panel and click the plus symbol at the top of the right panel. Select "Secure Shell Key" in the window that appears. Within the new secure shell, key window enter a description for the server that you are connecting to. This is a good method for connecting to a Raspberry PI for instance. The just create key will create the public key with a view to completing the process at a later point. The create and set up function will get you to log in to the SSH server and set up the public key. You will then be able to login to that SSH server without logging in from the machine with password and keys set up. A PGP key is used to encrypt and decrypt emails. To create a PGP key select GNUPG keys in the left panel and then click the plus symbol in the right panel. Choose PGP key from the list of options. A window will appear asking for you to enter your full name and email address. You will be required to enter a password to be associated with your key. This should not be your email password. It takes a while for the key to create. 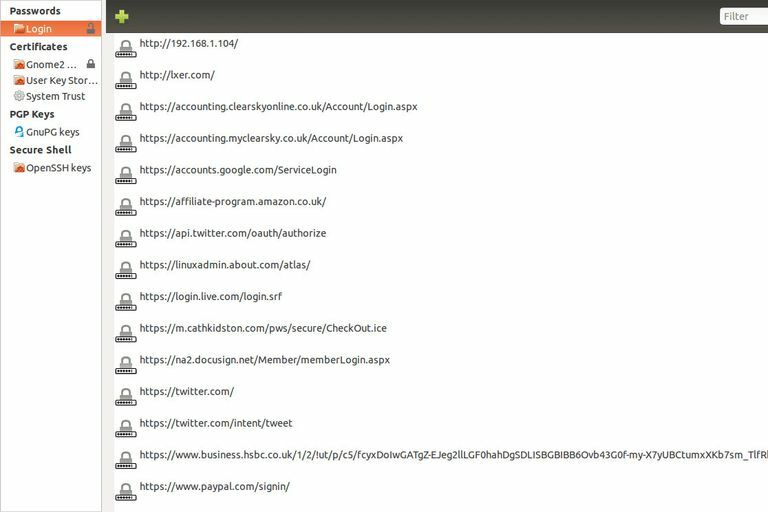 You should do other things whilst waiting such as browse the web as this helps make the key more random. You can now use the key within an email tool such as Evolution to encrypt your emails.